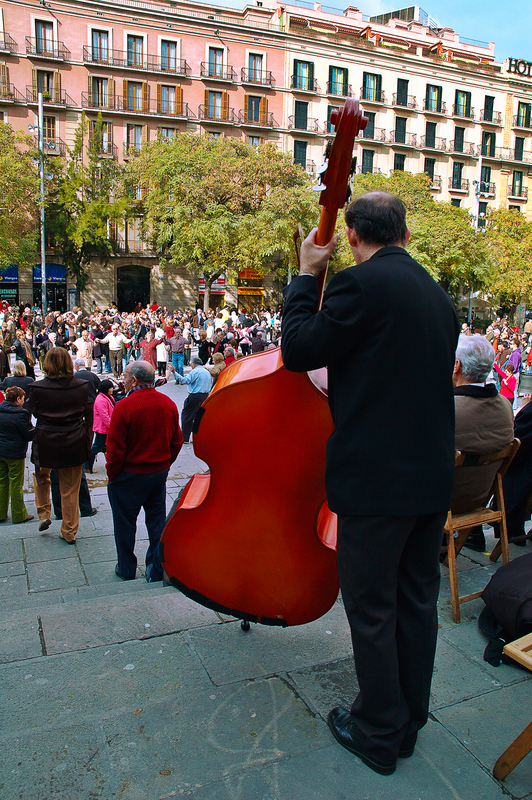 This contrabass or double bass player was part of a small band performing in front of a group of sardana dancers. The place is the square facing Barcelona Cathedral or Santa Eulalia Cathedral (video). If you check blogger labels below you'll find other musicians or instruments featured in Barcelona Photoblog in the past. Ei, me gusta mucho... pero te imaginas tener que ir luego con es pedazo de armario a casa? en el metro? o en el bus? uf.. qué movida eh? En fin, que te vaya bien por allí arriba, un saludo! Appears to be perfect weather for being outdoors, and the players must be good if the size of the audience is something one can judge by.